Background: Handoff miscommunications are a leading source of medical errors. 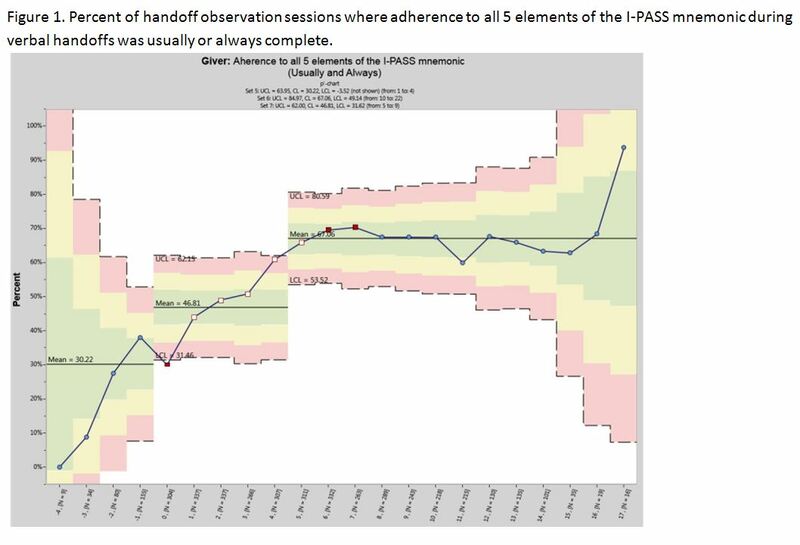 Medical error and adverse event rates decreased following implementation of the I-PASS handoff program (a bundled intervention using a structured mnemonic, I-PASS, and other initiatives to sustain implementation) in a pediatric research trial. Whether I-PASS can be implemented in settings outside academic pediatric institutions is unknown. Methods: Our objectives were 1) To implement I-PASS for resident physician end of shift handoffs in a variety of hospitals and medical specialties using a mentored process; and 2) To measure the association of I-PASS implementation with handoff quality and provider-reported medical error rates. We implemented I-PASS in 32 hospitals [community (n=12), academic (n=20)] and multiple specialties [internal medicine (n=13), pediatrics (n=12), other (n=7)]. We paired each site with an external mentorship team of I-PASS experts that conducted a site visit and provided ongoing monthly coaching. Site leads participated in program wide webinars and shared data with participating sites. Validated handoff observation tools and a provider survey assessed verbal and written handoff quality and rates of handoff-related adverse events. Results: Across 32 participating hospitals, we assessed verbal handoff sessions of the giver (n=4176) and receiver (n=3385), reviewed printed handoff documents (n=1770), and distributed monthly end of rotation surveys (n=2081). Implementation was associated with increased inclusion of all 5 I-PASS mnemonic elements for both verbal (21% vs 64%; Figure 1) and written (10% vs 67%) handoffs. Additionally, increases were noted in the frequency of high quality verbal (31% vs 73%) and written (55% vs 71%) patient summaries, verbal (21% vs 71%) and written (42% vs 69%) contingency plans, and verbal receiver syntheses (47% vs 78%). 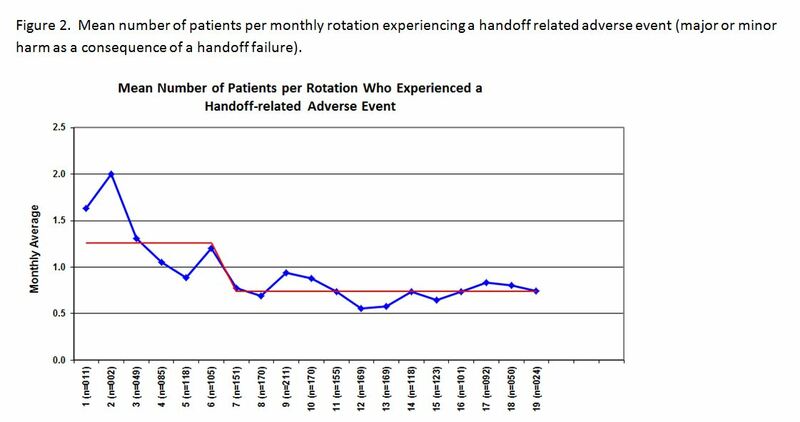 Handoff-related adverse events decreased by 42% (Figure 2). All changes statistically significant (p<0.05). Improvements were similar across provider types (adult vs. pediatric) and settings (community vs. academic). Conclusions: The I-PASS Handoff program is associated with improved handoff communication and patient safety across a variety of settings and provider types. Starmer, AJ; O'Toole, JK; Spector, N; West, D; Sectish, T; Schnipper, J; Srivastava, R; Goldstein, J; Campos, M; Howell, E; Landrigan, C; Study Group, S. MENTORED IMPLEMENTATION OF THE I-PASS HANDOFF PROGRAM IN DIVERSE CLINICAL ENVIRONMENTS. Abstract published at Hospital Medicine 2018; April 8-11; Orlando, Fla. Abstract Plenary presentation. https://www.shmabstracts.com/abstract/mentored-implementation-of-the-i-pass-handoff-program-in-diverse-clinical-environments/. Accessed April 22, 2019.